Forex trading in the United States, and perhaps globally, may be revolutionized by the introduction of Cantor Exchange’s (CE) short duration binary contracts, which opened earlier this year. These binaries offer the same basic features of binary options as other markets, including a fixed payout at $100 per lot and no margin borrowing, but the CE offers five-minute expirations as well as end-of-day binary options on the EUR/USD, GBP/USD and USD/JPY. The CE also permits an “RFQ” process whereby market participants can request to trade any expiration time so long as it coincides with the calculation of CE’s minute-by-minute spot settlement index. Here’s how shorter duration (e.g., five-minute) expirations work and the implication of these instruments for traders and the industry. Certainly five-minute binaries are more exciting than longer duration binaries; however, the key question is whether five-minute binaries can be traded effectively. For such short duration options, would a flip of a coin work as well as a more studied approach? Would one-minute binaries be a tool for assisting the spot trader? The answers are surprising. At each five-minute interval, the trading interface provides an opportunity for traders to place a buy or sell trade on whether a spot currency pair will be above or below strike prices, which are set five pips apart. If the trader buys the contract, he believes that the price will be above the strike at the moment of expiration. If the trader sells the contract, he believes the price will be below the strike at the moment of expiration. During the five-minute interval, the value for the spot currency pair is updated as the exchange tracks the tick-by-tick movement of each foreign currency rate. The spot currency value, called the spot index, is updated every half second. In contrast to other platforms, the binary contract always settles to the index price shown on the screen. There is immediate feedback on where the price is and whether it is a winner or loser. Another feature is that participants may choose to enter orders right up to the expiration of each option, virtually to the last second. Like binaries in general, there is known maximum payout and known maximum risk. For each contract, winning buy trades pay a fixed $100 and the maximum risk is the amount paid. For example, a trader buying the USD/JPY 95.70 strike price for 7:50 settlement would risk $44 to gain $100. Winning sell trades mean the trader keeps the selling price and the maximum risk on this trade is the difference between $100 and price received. For example, a trader selling the USD/JPY 95.70 strike price for 7:50 settlement could earn $36 by risking $64 ($100-$36). The challenge is how to technically trade five-minute binaries, although really not that different than the challenge of trading any time frame. Certainly, because of the very short-term time periods, the trader is confronted with the need to separate the signal from the noise. But, it turns out that price action, even below the five-minute time interval, exhibits classical patterns. 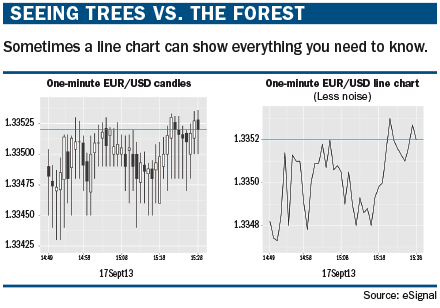 We can see for example, a comparison of the one-minute EUR/USD candle pattern, versus the one-minute line chart (see charts). The one-minute candles pattern is difficult to interpret because of the tails, thus noise. The line chart filters out the noise and better reveals the contours of sentiment and twists in direction much more clearly. Traders will find channels, swing failures, even Fibonacci-based moves at these intra-five-minute levels. Spotting patterns even within one minute of the expiration improves the probability for winning at expiration. Using pattern recognition rather than technical indicators is likely to be the central tool for trading these binaries. Yet, fundamental analysis should not be ignored. Ultimately, buying or selling in the direction of the prevailing bullish or bearish sentiment generates a statistical advantage. Five-minute binaries also have potential for being very useful in trading the spot currencies. If a trader already is holding a position, he needs to detect at the earliest possible time whether there is “evidence” of a threat to his position. A five-minute binary can be thought of as a trading “drone” detecting market conditions. The trader also can watch the five-minute bid/ask platform and detect what the expected probability of an up-move in the time left to expiration is. If, for example, with two minutes left, the cost of buying a strike price at- or near-the-money is 80, it is an indication that there is an 80% expected probability of success. If the cost is only 20, the sentiment is quite pessimistic of the price moving higher to the strike price. Finally, five-minute binaries can be used to offset losses. For example, if a trader is in a losing position and wants to ride it out, he can put on the binary in the direction of the loss, and get paid back as long as the market keeps moving in the direction of the loss. In this context, the five-minute binary becomes a “rebate” option.